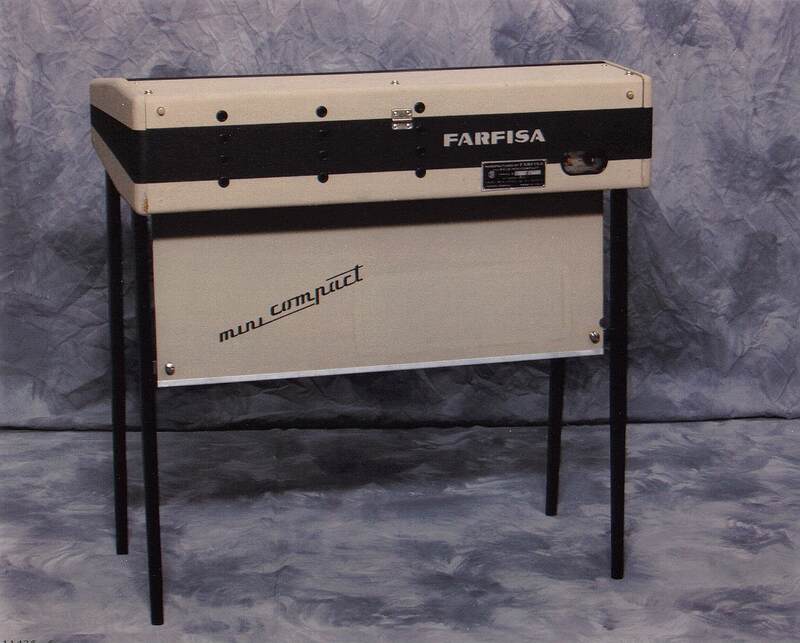 The well-known, well-respected (and sought-after) Farfisa Compact line includes the Mini-Compact, the Compact, the Compact Deluxe and the Compact Duo. 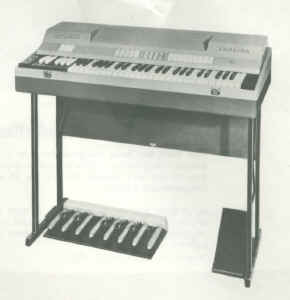 In true combo-organ style, there is more than one version of each, all of which are described below. Some clues to their dates are available in advertisements, brochures, price lists and service manuals. Some versions definitely seem to have preceded others, but pinning a particular model down to a range of dates is difficult, and there certainly was some overlap in production. 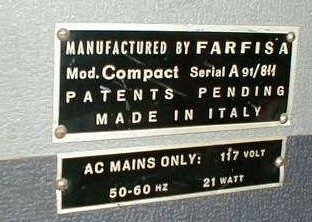 The Compact line was available from roughly 1964 until about 1970. 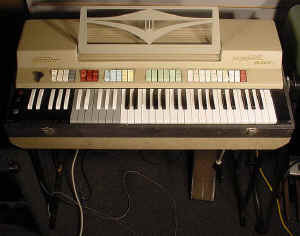 "Where Vox and others start with a square wave (50% pulse wave) and filter it a little for the brighter voices and filter it down a lot to get flute or sine wave voices, Farfisa's MULTI-TONE BOOSTER starts with its unique 67% pulse wave filtered down into a sine wave, and as you move the knee lever or add the ALL BOOSTER switch, a heavily HIGH-pass filtered pulse wave is added to the sine wave. On an oscilloscope, it looks like a narrow spike is stabbing down into the top of the sine wave, slightly off to its right side. This gives the Compacts their different sort of bright sound which can get brighter and more raucous than most other brands." Colors, plastic tops: From what I've been able to find, it seems that all Minis, Deluxes and Duos came in the same light Beige color, almost a Grey when new, but I'll stop short of calling it that. Most seem to have faded/yellowed over time to almost a tan color. The basic Combo Compact, all versions of it, came in both Red and Grey (actual Grey, which remains Grey in current specimens), with Red seeming to be the more common color (so don't let anyone tell you that Red is the rarest color!). I've heard from a few people who claim to have seen Compacts in Green. I've never seen one myself (except one or two that were obvious aftermarket paint jobs), but it's kind of hard to discount when you hear the same story from multiple sources - some on opposite sides of the Atlantic!. Maybe the grey/beige ones had just enough green to fool the color-blind among us. 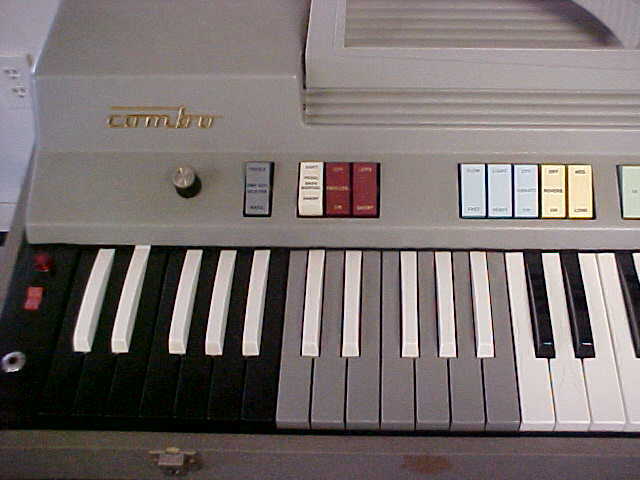 The plastic tops on all versions of the Combo Compact, except the last, were a smooth, shiny finish. 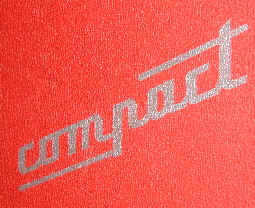 The last Compact version, the Compact I, had a top with a textured finish, as did all versions of the Deluxe Compact. Typically, I've heard from at least one person who has seen a basic Compact with a textured top - yeah, with Combos, the only rule is that there are ALWAYS exceptions! 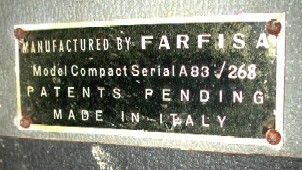 Reverb: I got this tidbit from Mike (who asked not to be credited), who actually worked for Farfisa when the Compacts came out, and he had this to say about the Reverb: "Tube preamps were used where the spring reverb was used. 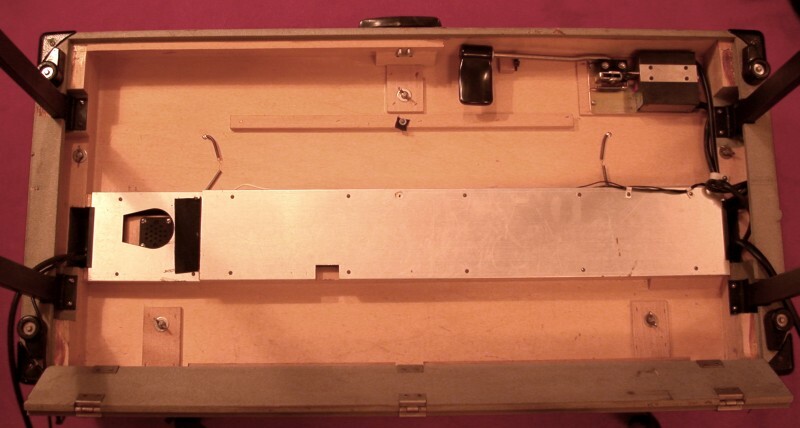 To overcome Hammond's patent we made our own units, using piezoelectric transducers instead of magnets, and this required 100V plus drivers, at the time not easy to have with transistors." Click on one of the links below to go to the section of this page that deals with a particular model. 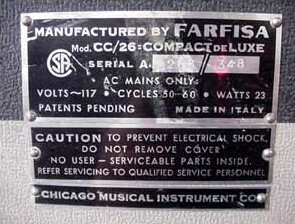 I've included a section for the oft-asked-about Compact Volume Pedal, and a bit on the Bass Pedals, as well. Little-brother to the Compact, the Mini offers a good compromise between features and size/weight. 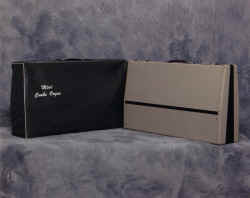 There are three flavors of the Mini: The basic Mini Compact, the Mini Deluxe, and the Mini Deluxe I. 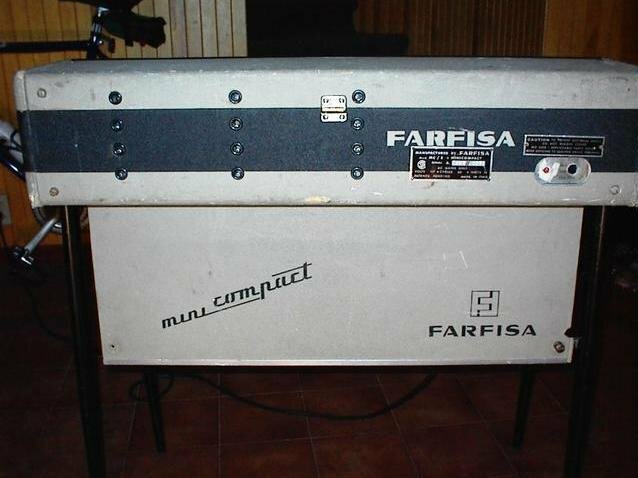 The latter two are actually Farfisa designations I've gleaned from literature, but all sport only the name "Mini Compact". 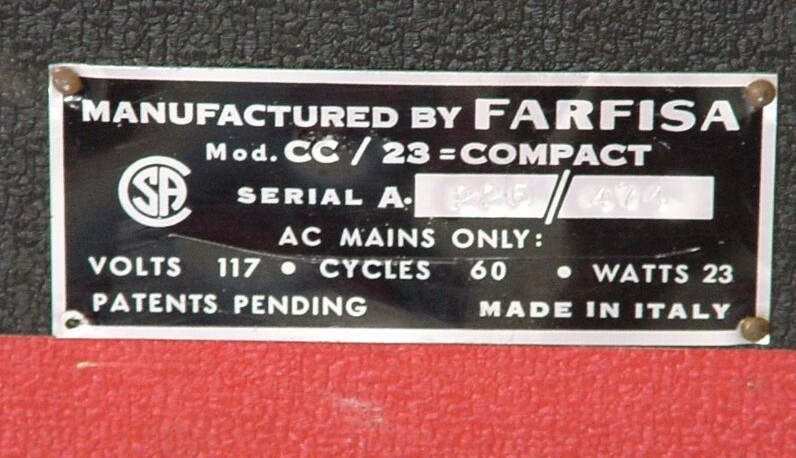 Those that have a model number on their ID plates list it as "Mod. 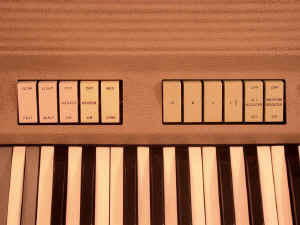 MC/3 = MINICOMPACT" The word "Deluxe" never appears anywhere on the organ, as far as I know. 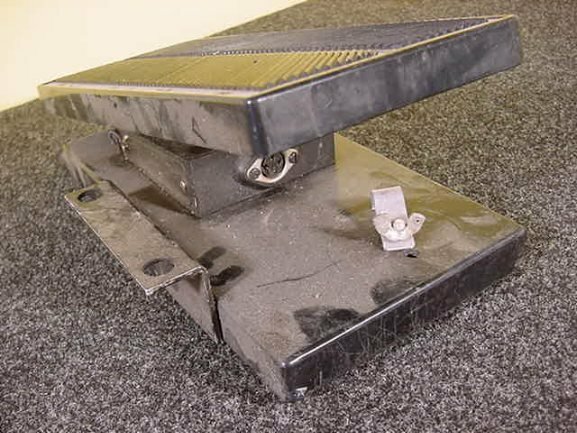 Volume pedal/Knee Lever: All the Minis feature the famous Multi-Tone Booster and Knee Lever. In the Mini, however, the Knee Lever performs the dual function of Booster level and Volume control, even with the Booster tabs switched on. 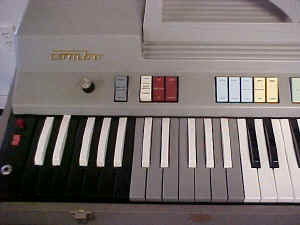 With the lever in normal position, the volume is very low, prompting many Mini (!?) owners to come up with a way to fasten the lever in its fully-pushed position. 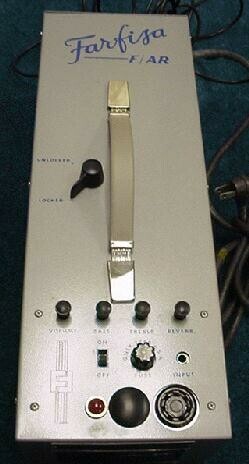 Thankfully, an optional volume pedal (identical to the one used for the larger Compacts) remedies the situation. When plugged in, the pedal performs normal volume control functions, freeing the lever to concentrate on its more natural function of adding in the Multi-Tone voices. 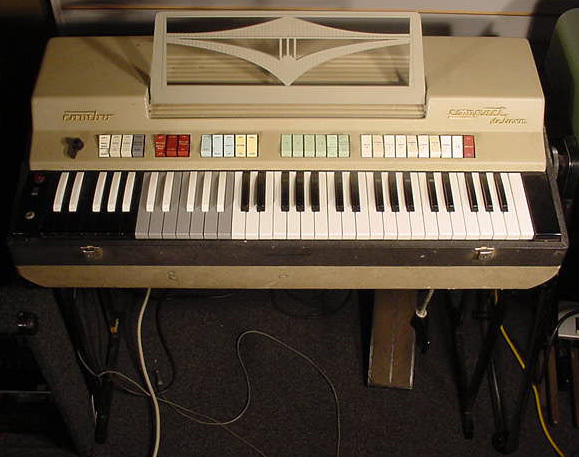 "The footage tabs are actually associated with the voice tabs and the multi-tone booster. With MTB off, if all the footage tabs are off, you won't get any sound, regardless of which voice tabs are engaged. With MTB off, if you engaged 16', 4', dolce, and string, you'd hear 16' dolce, 16' strings, 4' dolce, and 4' strings. You can really get a fair number of decent sounds out of the li'l guy"
Introduced about 1966 (First price list I've seen it in is April, 1966), this is by far the most common version of Mini-Compact. 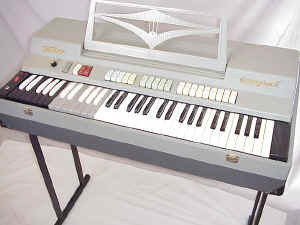 In the Deluxe, the first octave is converted to a Bass octave of grey keys, switchable between a fixed Bass voice and and extension of the Treble section. 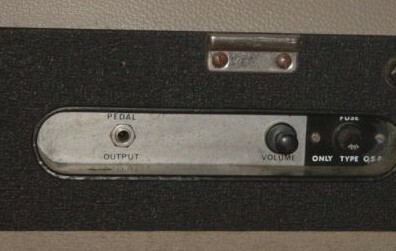 The Bass Voice is controlled solely by the Bass volume control. 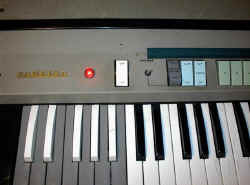 In exchange, it gives up the Vibrato Light/Heavy switch. The Mini-Deluxe has a DIN jack on the underside for the volume pedal, right next to the knee lever, instead of a hard-wired cable and DIN plug. This connects to any standard Compact (or Fast-3) volume pedal, with an appropriate DIN cable (3-pin, male-to-male). 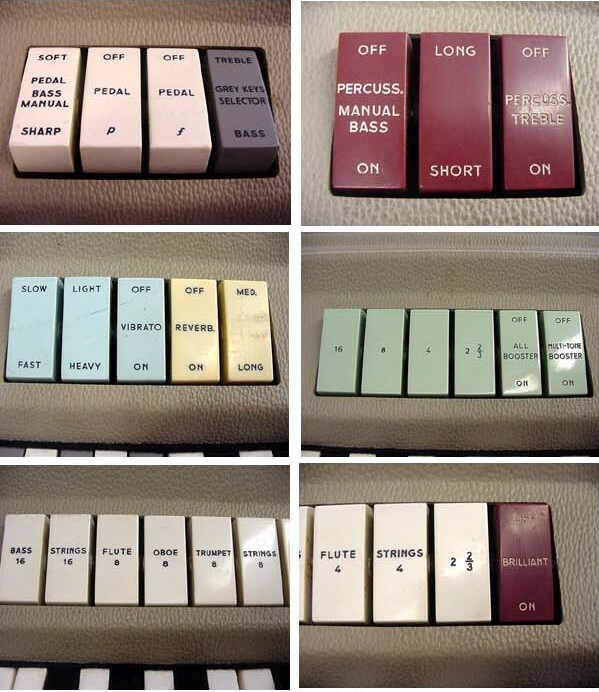 Click on the picture for a nice BIG closeup of the tabs. 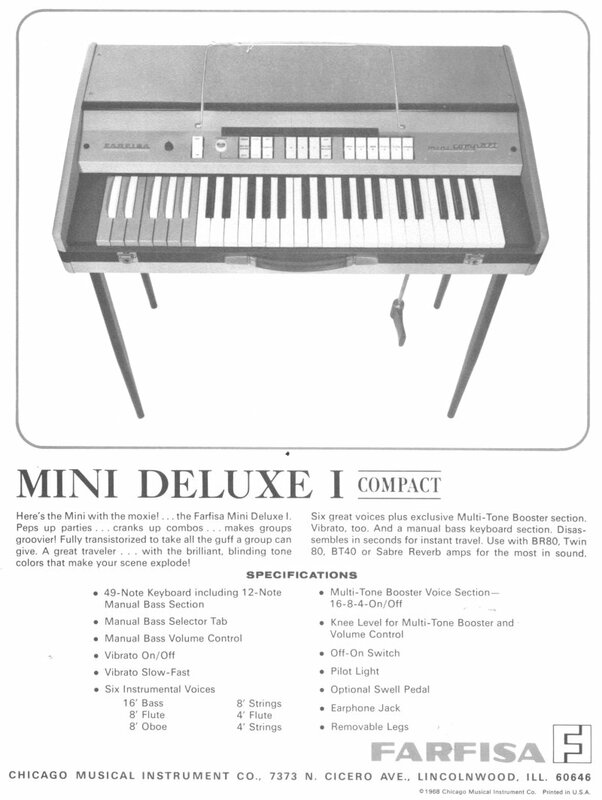 The Mini Deluxe I came out in roughly 1968 (first price list I've seen it in is August, 1968). It takes the features of the Mini Deluxe, adds an On/Off tab for the Multi-Tone voices, and expands on the non-Multi-Tone voices, offering a total of 6, in 3 ranks, coming very close to the full complement found on the Compact. 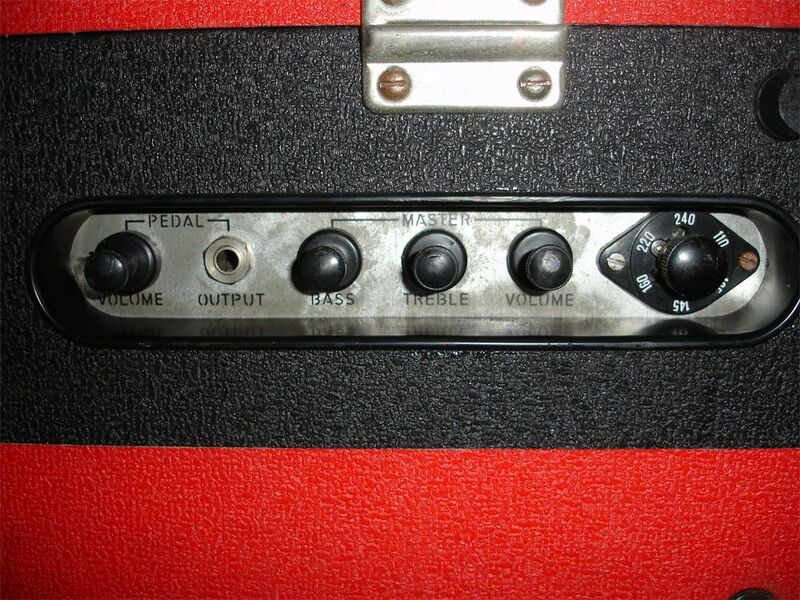 The Deluxe I has the same DIN socket as the Deluxe for the volume pedal. 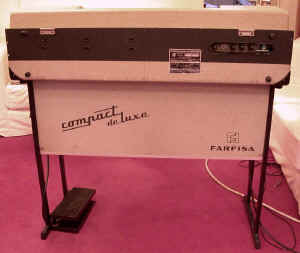 The venerable Farfisa Compact is, next to the Voxes, probably the best known combo organ around. 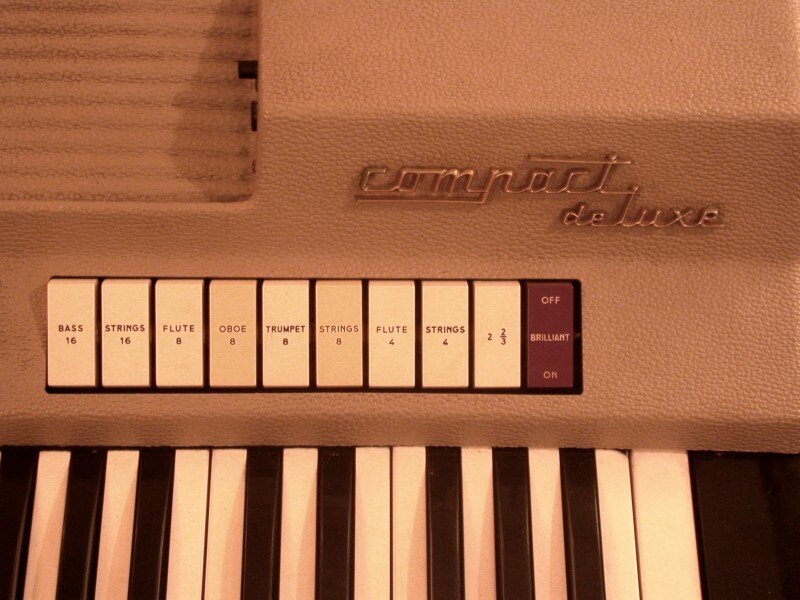 The Compact is one of the few combo organs that actually uses tubes (valves). 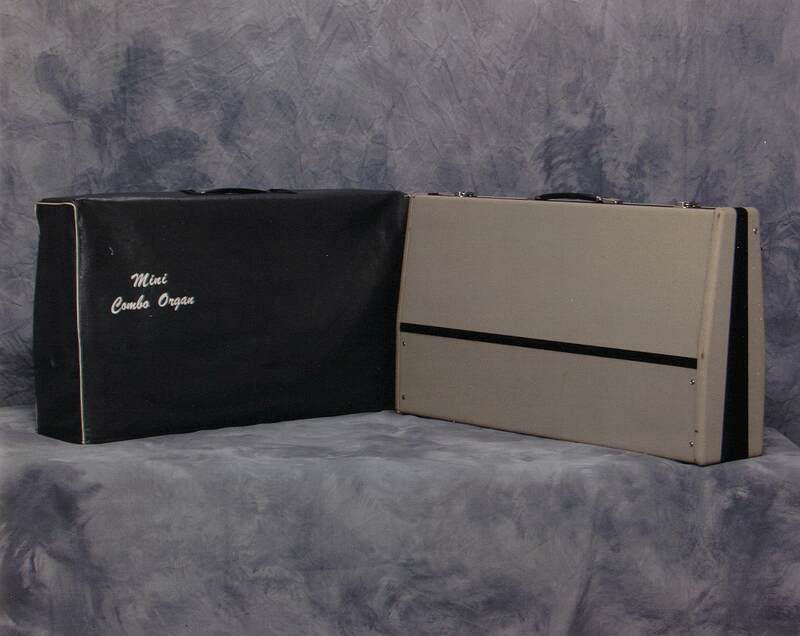 Both the Compact and the Compact Deluxe have tubes, which are used primarily for the Reverb circuit. 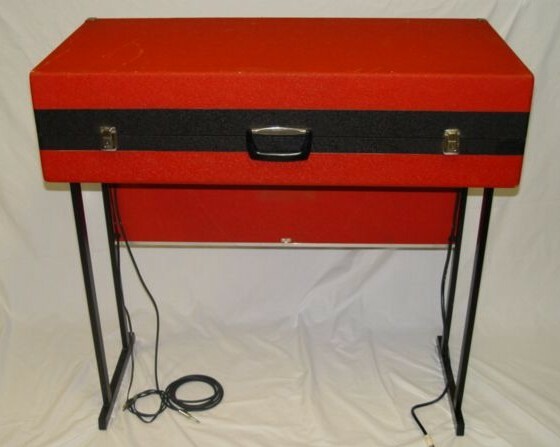 Richard B. explains: "They needed the tubes to drive the 'ceramic phono cartridge' reverb spring on the Compact and the Deluxe. 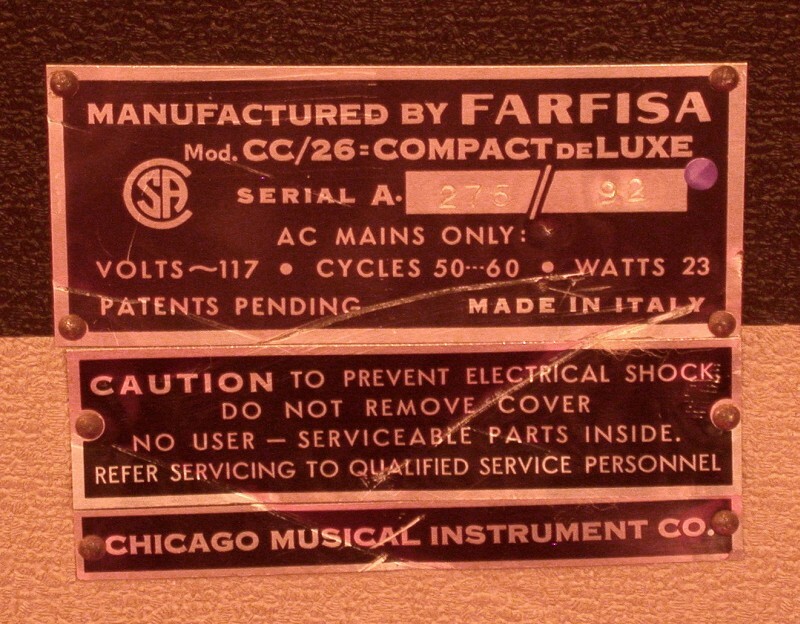 Back then high voltage transistors were really expensive. That's why compacts and deluxes have tubes but minis, duos or the Fasts don't." 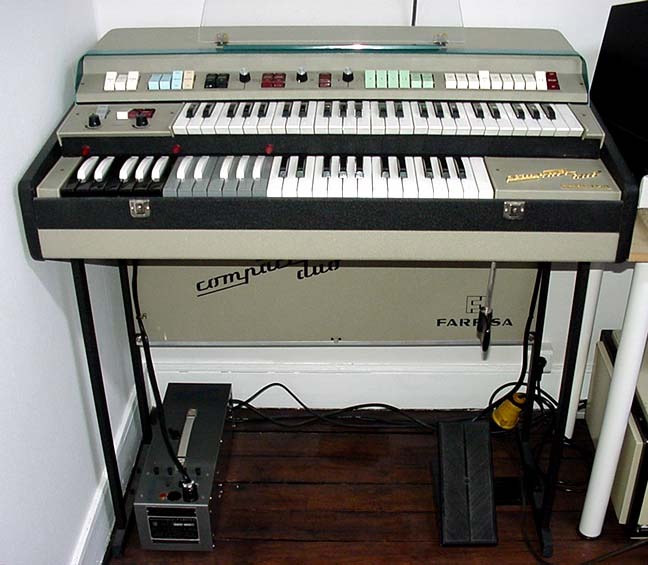 Minis, Duos and Fasts don't have a built-in spring reverb, and so don't require tubes (the Duo's reverb is outboard in the F/AR unit). 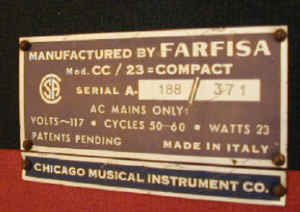 The Compact uses two ECC83s, and one half of one of them (they're twin-triode tubes) is used in the preamp circuit. 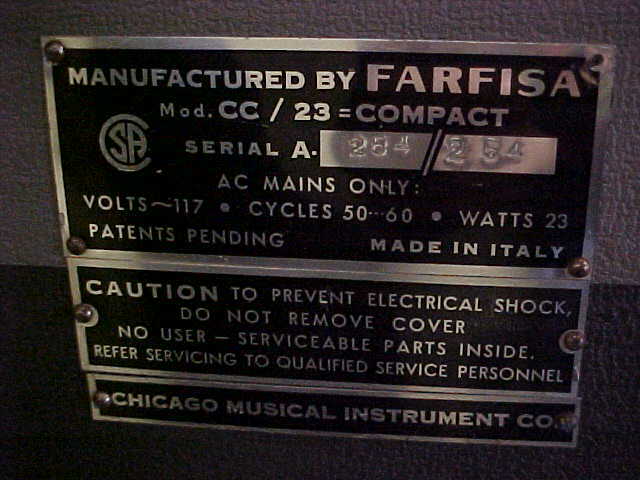 Many Compacts have a sticker that says “Electronic Transistorized”, but this does NOT indicate that the model is tubeless, just that it has transistors, like virtually every other combo organ around. Regarding colors: Despite rumors to the contrary, a Red Compact is NOT a rarity. Red is definitely the most common color for the basic Compact, with Grey running a close second. The typical Red Farfisa Compact. 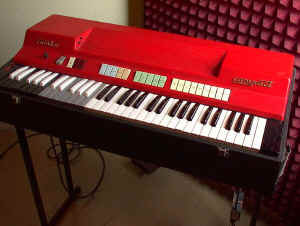 This is by far the most common version (in Red or Grey), but it wasn't the first one to come out. And a nice specimen in Grey. Another nice example in Grey, with a very minor, but unusual variation. 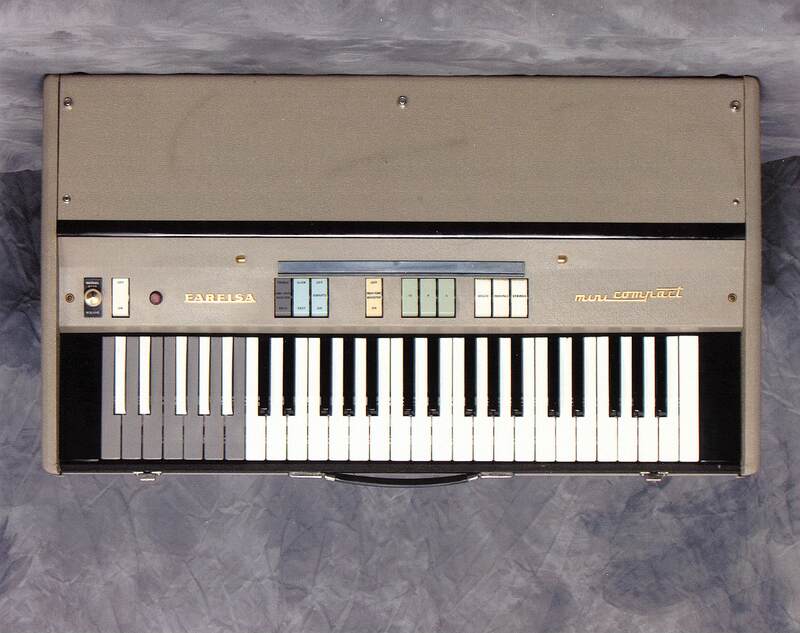 Note the gold lettering on the plastic top - "FARFISA ... compact", rather than the MUCH more common "combo ... compact" Henry Badowski tells me that all of the Compacts he's seen in the UK have this wording. From my (far more limited) experience, I'd tend to agree. The one shown here found its way to Australia. This rear panel is pretty standard among the basic Compact. 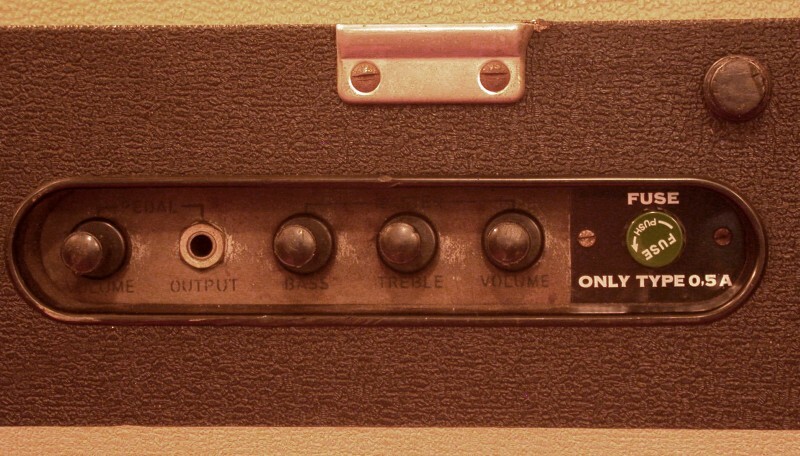 The "Pedal" volume and output are for the bass octave, whether or not pedals are used. 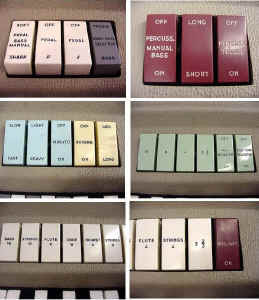 The first six ID Badges pictured below are from a standard Compact. There are 2 main styles. The ones on the left are, I believe, older than the ones on the right. Here's a weird one I had never seen before. 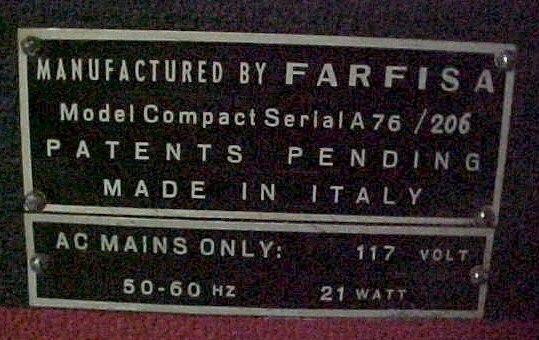 Note the Model name of CC/21. Every other plate I've seen was CC/23. And here's the organ it came from. 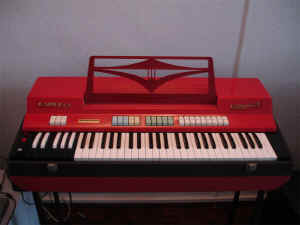 It's the standard "second verson", but is from the UK, and has the words "FARFISA" and "Compact" on the red top. The main difference is that it has only 4 green Booster tabs - it’s missing the “All Booster On” tab, sort of like the Mini Compacts. 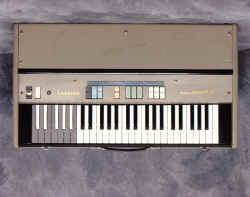 This version typically has the older style ID badge (see above), and the rear control panel is different, lacking the separate output jack and volume knob for the Bass section, and replacing the fuse holder with a voltage selector (see pictures below: One other difference that's been reported a few times is that this model does not have the holes in the top where the music rack would attach. This is an ID badge from one of the first versions.. 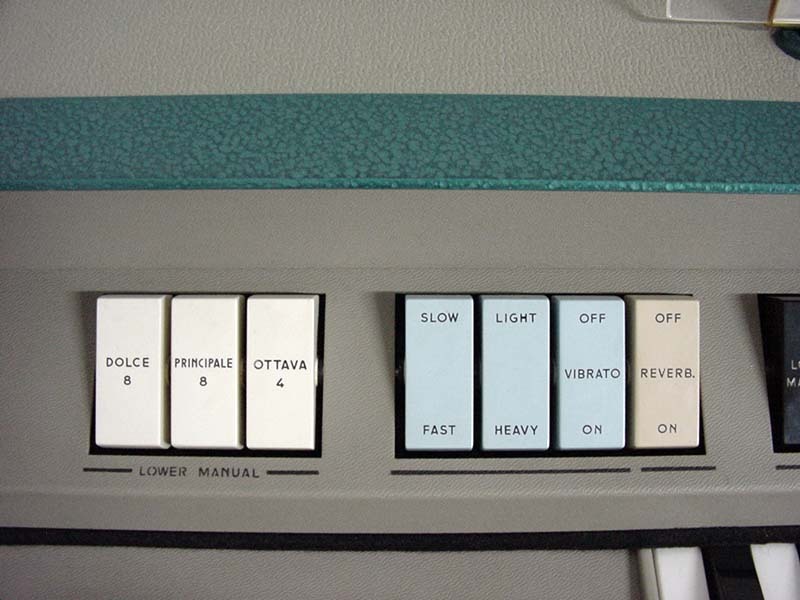 It's like the other "early" Compact plates shown above, but it includes the middle two lines showing the AC power characteristics. 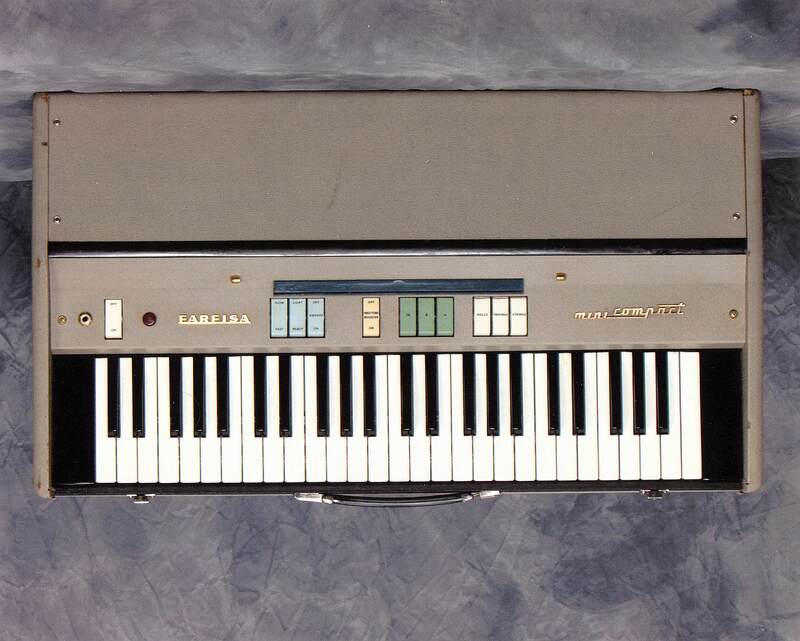 This is from the 1965 "meet the combo compact" book. Note the wording on either side - it's "Compact......FARFISA", rather than the far more common "Combo.....Compact"
Not all specimens of the first version are like this, but many are. I'm sort of going out on a limb here by calling this a "Compact I". My only reason is the August, 1968 price list, which lists a "Compact I" along with the "Mini-Deluxe I" and the "Combo Deluxe I Compact". 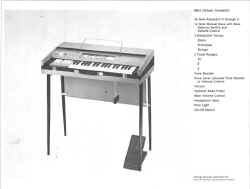 This is also the version featured in the 1967 "The Psychedelic Sound" ad. This one's almost a Deluxe. 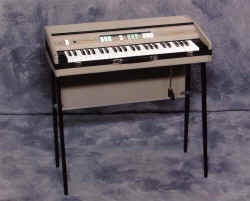 It has the switchable 2nd octave of gray bass keys, and Percussion. 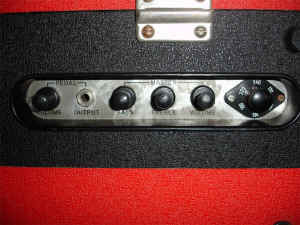 The three white bass volume tabs have been replaced by a Bass Volume knob. 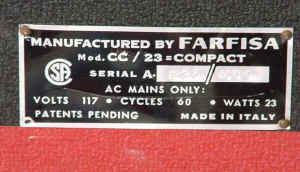 There are no other markings, however, to distinguish it from a regular Compact. All the lettering and the ID badge are the same. Left side controls - here's where the difference is. 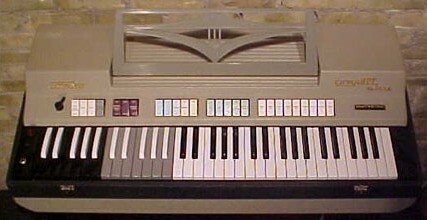 Note the textured plastic top. 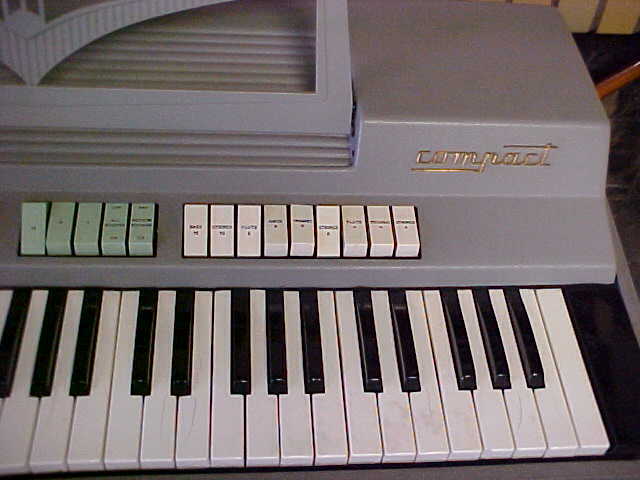 This is the only version of the Compact that has this type of top - all the others are smooth. ID badge from a "Compact I" - looks just like one from the standard Compact. 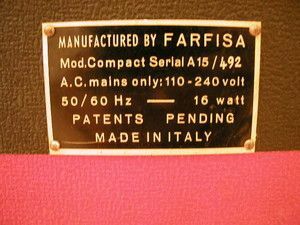 The Compact Deluxe was more than just an additional version on the Compact - it had its own name and model number designation - "Mod. 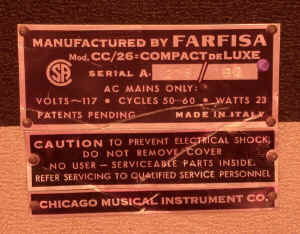 "CC / 26 - COMPACT deLUXE", as reported by the typical ID badge. Like the Compact, the Deluxe came in 3 versions, again, all sharing the same model name/number. I think this one came out in 1966. To the features of the Compact, it adds the 2nd octave of grey bass keys, a Soft/Sharp selector for the Bass section, and Percussion, selectable for Bass and/or Treble. Except for the Pedal p and Pedal f tabs, and the the Percussion Bass tab, this one is identical to the Combo Compact I. 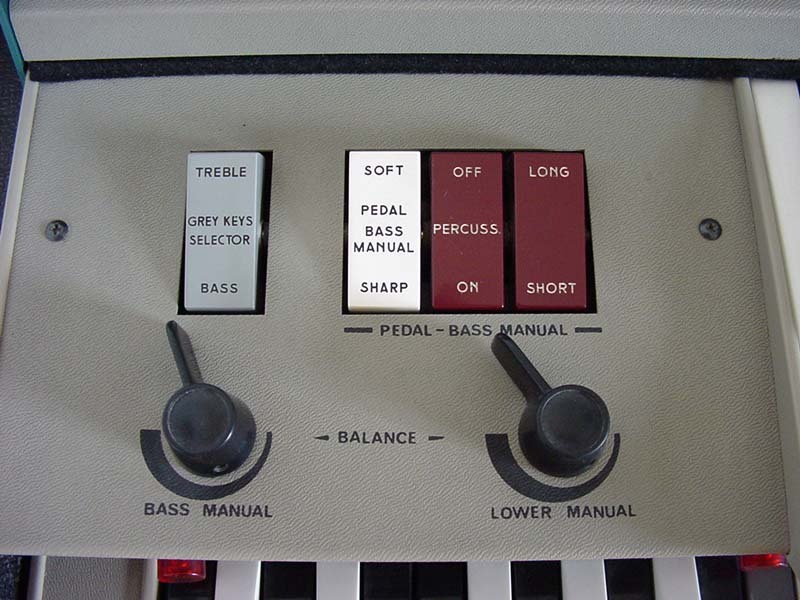 Note that, while there's a Bass Volume knob, it seems that two of the Bass Volume tabs from the regular Compact have returned - sort of. 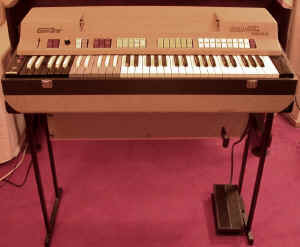 The Pedal p tab lowers the volume of the Bass octave, and the Pedal f tab raises it - so with this one you've got not one, but TWO completely different methods of altering the volume of the Bass octave - wow, the mind just reels with the dizzying array of possibilities afforded by this arrangement! An "enhanced" version of the Deluxe, this one adds 2-2/3' voices for both White tabs and Green Booster tabs. 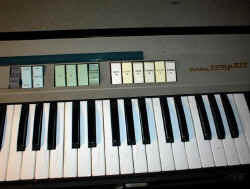 It also adds a Brilliant tab, but at the expense of the Piccolo 4', which has gone missing. 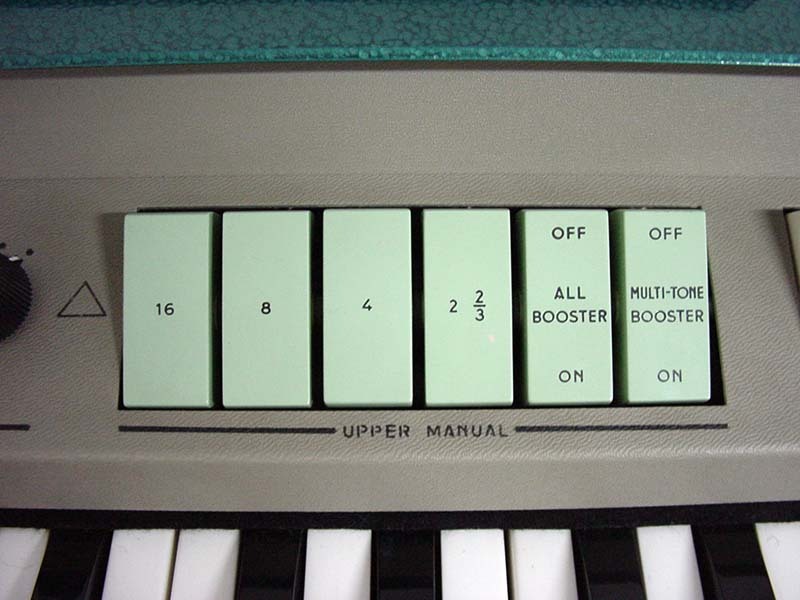 The Brilliant tab only affects the 2-2/3' voice (white tab only, not the green tab), which, with or without Brilliance, produces a pretty mellow sound (or so I'm told). 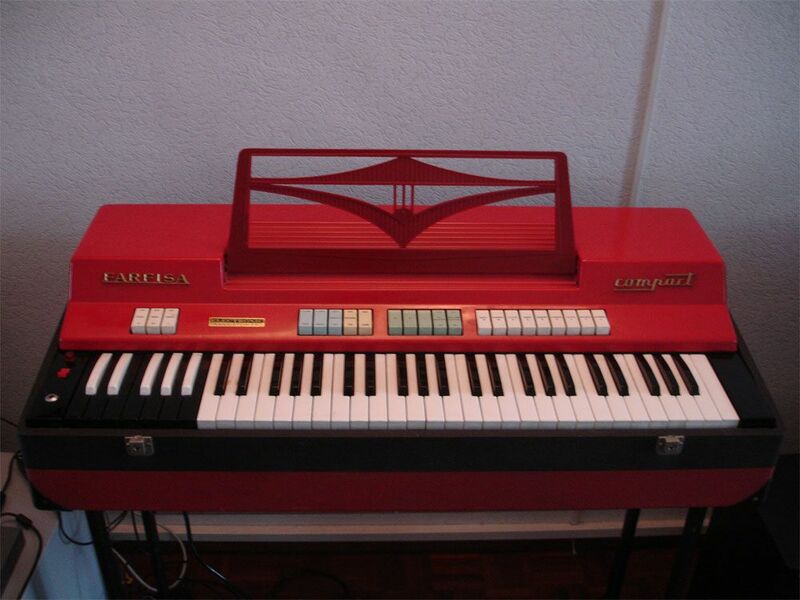 And here are two Deluxes, a Version 1 and a Version 2, with "Farfisa" on the left, and " Compact Deluxe" on the right (the top one has the last part of the name broken off). These are the only two Deluxes I've seen with that wording/ The owner of the one in the top picture claims that the green color is original, that scratches in the plastic reveal the same color underneath (but the woodgrain cabinet is definitely a refinish job). Of course, this new feature comes at the expense of those oh-so-useful "Pedal p" and "Pedal f" tabs - I guess they just ran out of room. 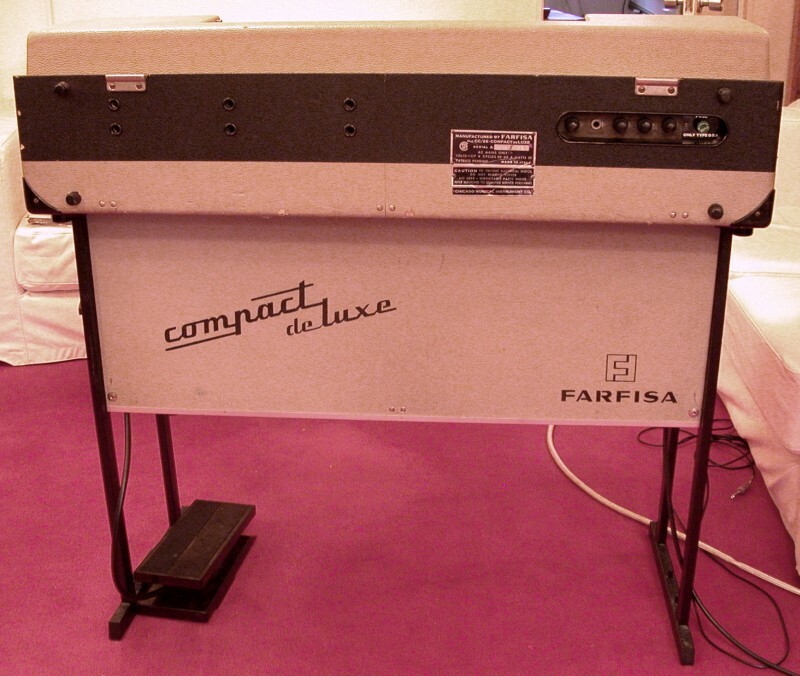 The Big Kahuna of the Compact line, the Compact Duo (Mod. 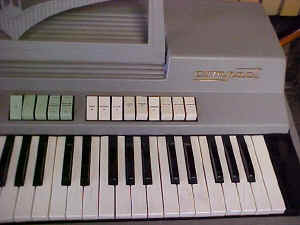 "CD /30=COMPACT Duo") has all the features of the Deluxe (second version), plus a whole 'nother keyboard on the bottom! The lower manual has the two bass octaves of the Deluxe, and a meager selection of three voices (at least they're not all 8', though). There's actually a bit more than that to be had - you get the cool red lights under the top keyboard, and the later version added Tremolo and Percussion to the arsenal. Plus, one version of the Duo has a mixture tab not found on any other Compact! 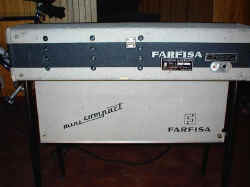 The Duo is a bit unusual, in that its power supply, preamp and reverb unit are all contained in an outboard box, the F/A-R, shown here (I believe the letters stand for "Farfisa/Amp-Reverb"). 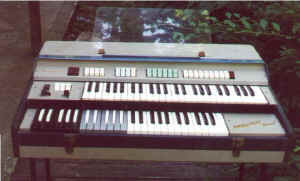 Why they chose to do it this way is anybody's guess, but it's been trouble for would-be Duo owners these days, since many a Duo has been separated from its F/A-R over the years, Still, unlike combo organ legs, a great many of these little beasties have managed to remain attached to their benefactors. And since they were also used with the Transicord accordion, there apparently are a fair number of them still around, and can often be found by themselves on eBay, though typically not cheaply. 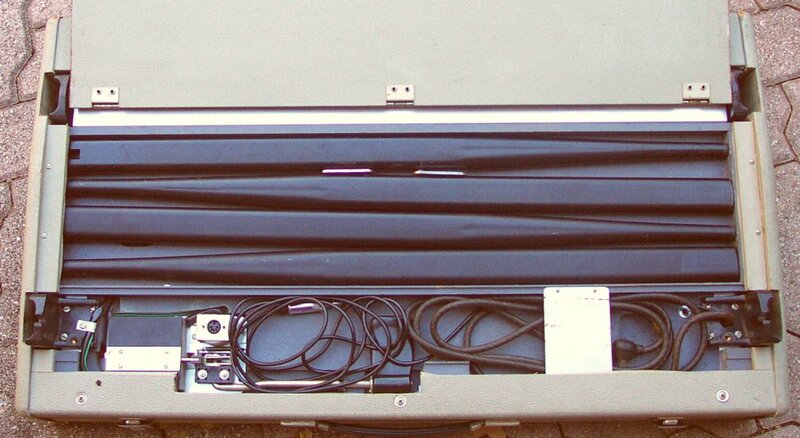 The Duos also came with a plexiglass music rack (which this one has managed to retain). 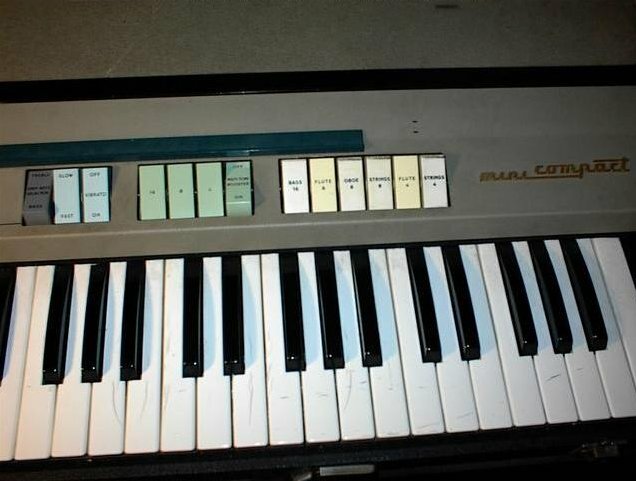 Now THAT's a good reason to own a Duo! 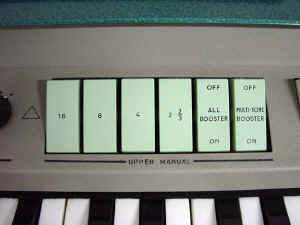 The last white voice tab is actually a mixture of 2' and 2-2/3' footages. Apparently, this mixture voice is not filtered to be as "soft" as the 2-2/3' tab on the Deluxe (or the other version of the Duo, below), and can be used to produce a more "Vox-ish" sound. 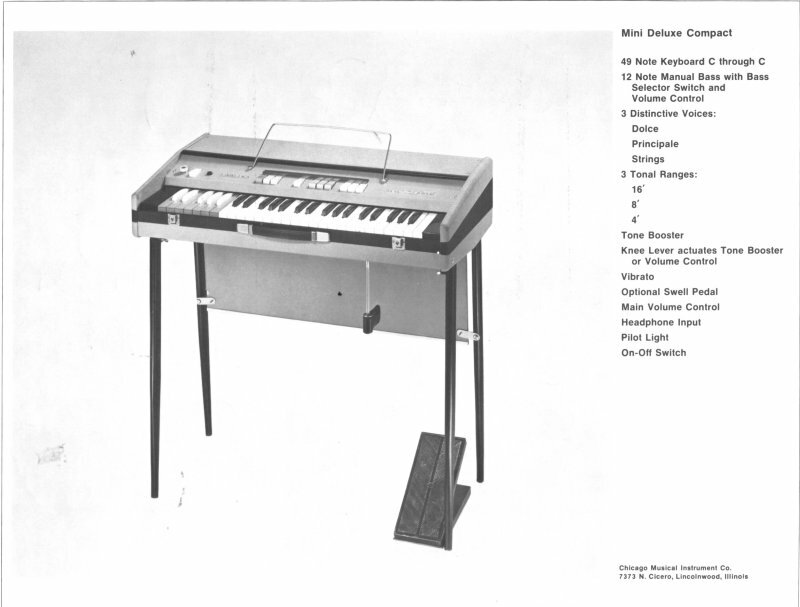 I'm told this version of the Duo was the one Rick Wright used on some of the earlier Pink Floyd albums, and that "See Emily Play" is a good example. 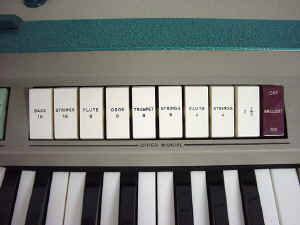 As in the Deluxe, the Brilliant tab affects only this mixture voice. Rear Panel: There isn't one! 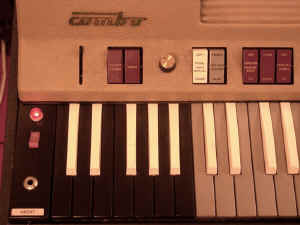 All the output controls are on the F/AR! 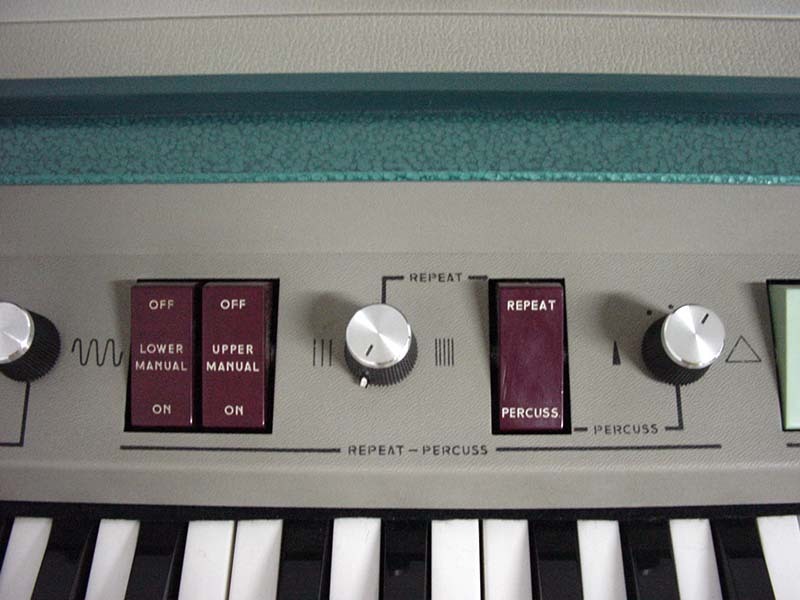 So you can think of them as delimiting the range of the bass section - the first two on indicate the Black keys are Bass, and the first and third on indicate the Black and Grey keys are bass. 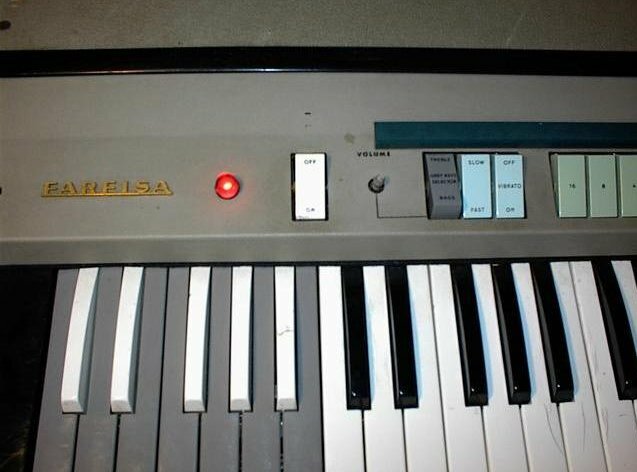 A good picture of these lights is included in with the next version of the Duo, below. 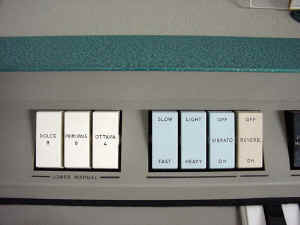 move around when you flick one of the switches" Yeah, now that makes sense! 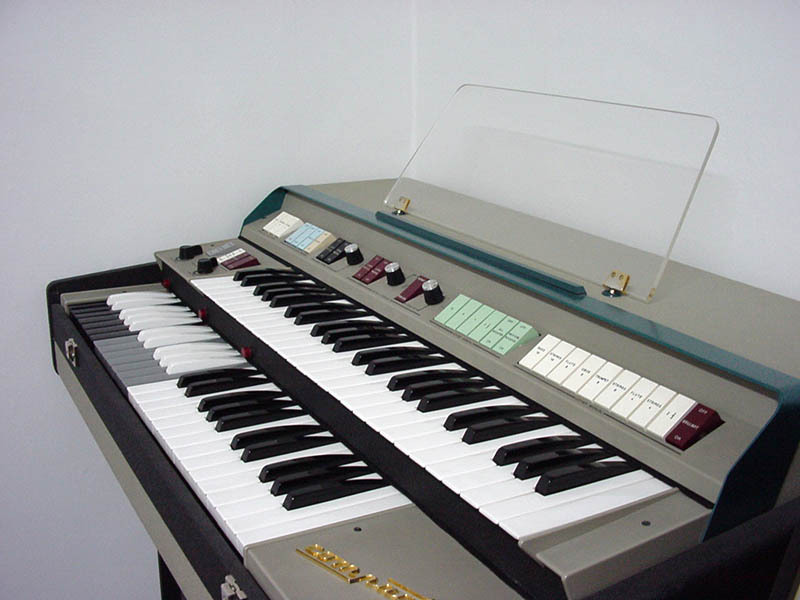 "The tone controls from the F/AR were at maximum all the time. 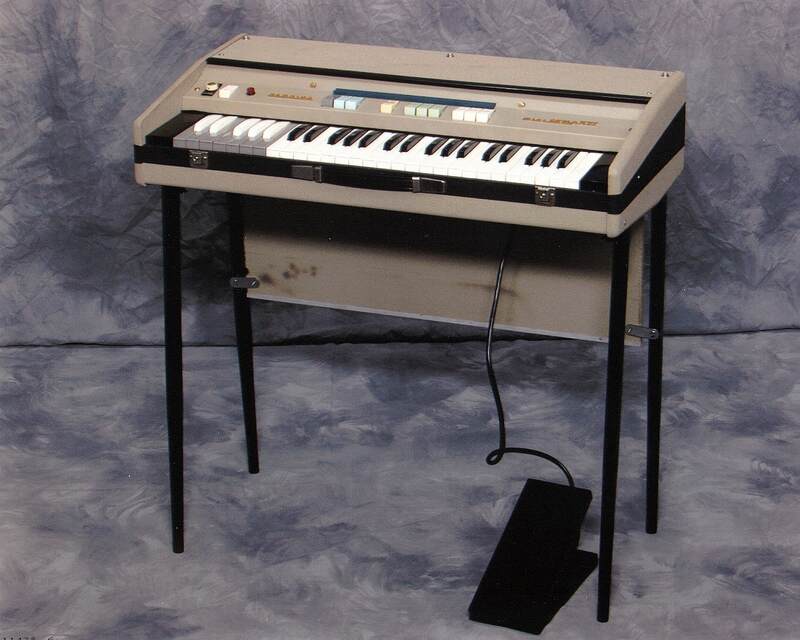 Some distortion happened in the sound card on some of the demos (especially the first ones). Demos 5-10 have left hand bass. 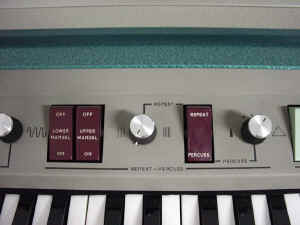 Those sounds that use the 2 2/3 - 2' tab are only available on the Compact Duo "non-effects version". 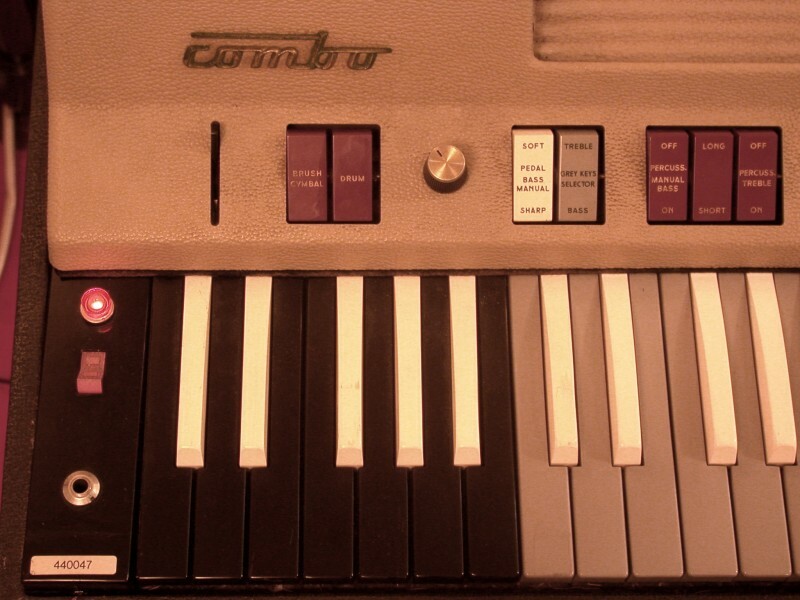 The rest of the sounds (demos 1-3, beginning of 8 and 9-10) are available on the basic single manual Compact too (except for the better quality spring reverb of the F/AR unit)." 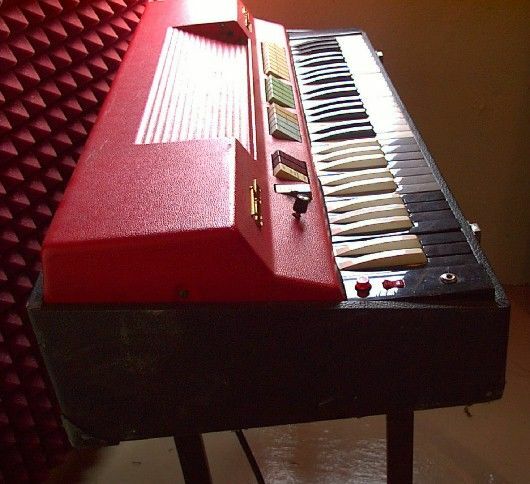 The second version of the Duo (which, to my knowledge was NOT called the "Combo Duo Deluxe I Compact" ha ha), introduced in 1966, adds a couple of potentially useful features - Tremolo and Repeat Percussion. 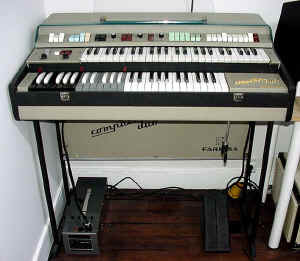 Other than that, it's nearly identical to its little brother, except for some shuffling of control positions Oh, yeah, it looks like they had to ditch those nifty "Pedal pp, p, mf" tabs - oh, well. The 2-2/3' tab (single footage, not like the earlier Duo's mixture) on this version is pretty much like that found on the Deluxe,with its mellower sound. 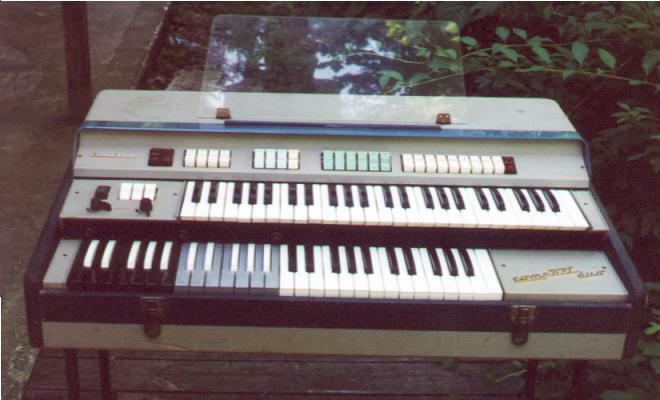 I'm told that this version of the Duo was used on later (post-Syd Barret) Pink Floyd. 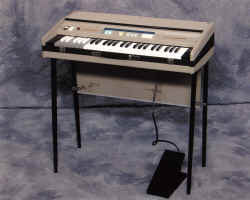 Oooh, look at that plexiglass music rack! A bit dusty, but there it is. 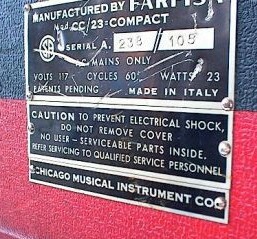 The well-known and sometimes mysterious Compact Volume Pedal. 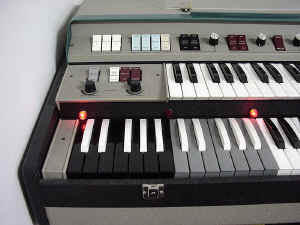 Unlike some organs (the Gibson G101 comes to mind), a Compact will play just fine without this pedal - the default when unplugged is full-volume. 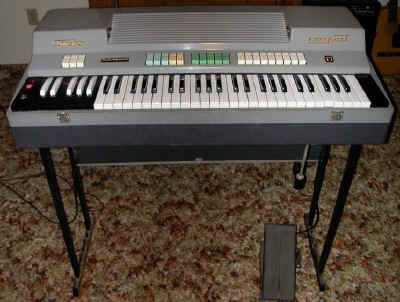 So don't let anyone tell you "oh, yeah, it works fine - it just needs the volume pedal"! This is an optical pedal - There's a small light bulb and a Light-Dependent Resistor (LDR) in there. 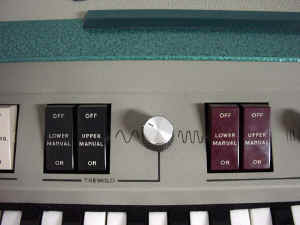 As the pedal moves, a mechanical shutter varies the amount of light allowed to fall on the LDR, putting a variable resistance across the output. Why not just use a potentiometer (pot)? 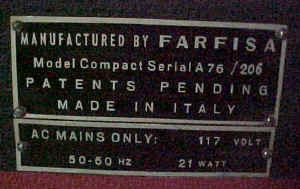 Durability and noise. An organ volume pedal gets a LOT of use (way more than the volume knob on a guitar or amp). A mechanical pot would wear out or get dirty and scratchy sounding fairly quickly. 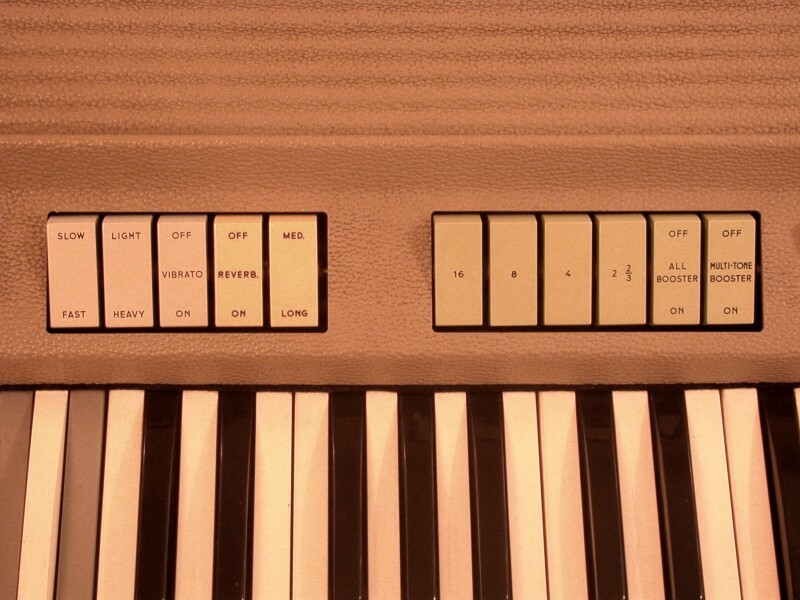 With the light bulb/LDR setup, there are no mechanical parts that directly affect the sound, so no matter how much it's used, it'll never get scratchy or wear out. 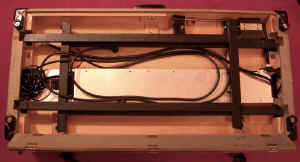 The bulb, however, will sometimes burn out, but it's easy to replace - just remove the little panel on the left.. 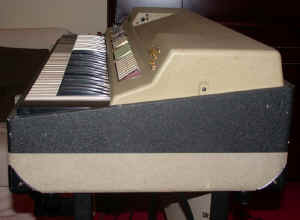 Note the bracket on the right side of the pedal. 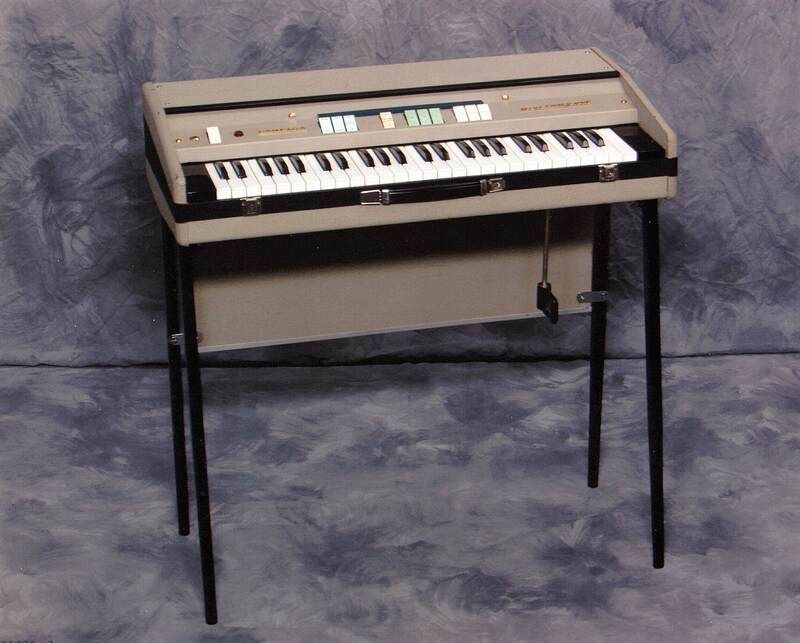 That fits into two posts on the bottom of the organ legs. There are thumbscrew adjustments underneath to get the fit just right. 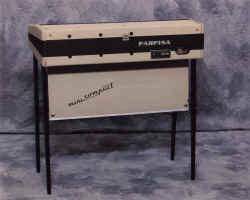 The Compact Pedal can also be used with a FAST-3 (and vice-versa) and at least some of the VIP series. 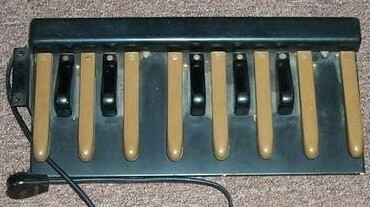 Typical set of Compact Bass Pedals. Note the bracket on the left with two holes - that's for hooking to the bottom of the stand (just like on the volume pedal). 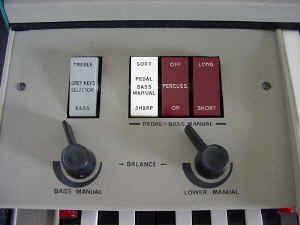 It's adjustable and removable, so some pedals may not have it FAST bass pedals look the same, but they're grey instead of tan. Interesting thing about these - note there are 13 pedals, but on the Compact, the Black bass octave is only 12 keys. So on a standard Compact (w/o the Grey octave), the pedalboard can play one note, the rightmost "C", that's unobtainable from the keyboard itself! 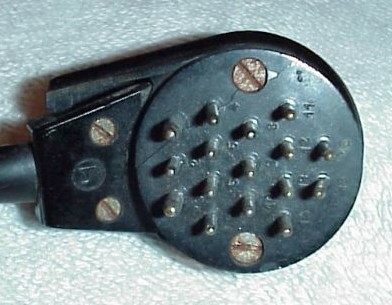 The 16-pin plug. 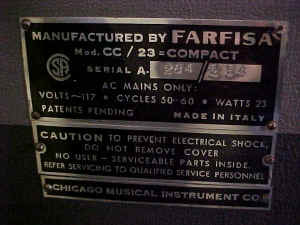 I think this same plug was used on the bass pedals for most, if not all, Farfisa combo organs (But I don't think they're all interchangeable). 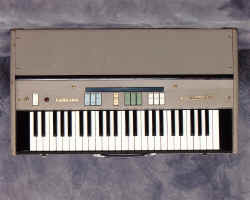 The connector is a Hirschmann MES160. I don't think it's made any more. If anyone knows of a source I'd be interested in hearing about it.